PM orders IDF to prepare for 'extensive campaign' in Gaza Strip following rocket attacks, says Israel fighting war on multiple fronts. Israeli Prime Minister Binyamin Netanyahu, who also serves as Israel’s Defense Minister, has ordered the IDF to prepare for an “extensive” military campaign in the Gaza Strip, following a wave of rocket attacks from the Hamas-ruled coastal enclave this week. 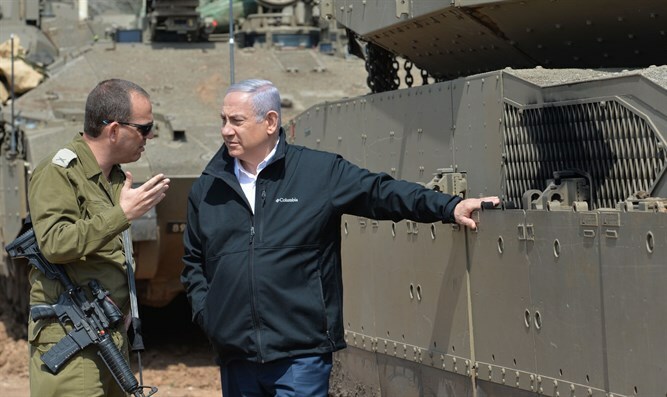 During a visit to the Gaza front Thursday, the Prime Minister inspected IDF staging areas near the Gaza border, and received security briefings from GOC Ground Forces Maj.-Gen. Kobi Barak, and divisional and brigade commanders, the Prime Minister’s Office said in a statement. During an address at the opening of a new segment of Highway 6 after his visit to the Gaza border area, Netanyahu said the IDF was “tightening” security around Gaza, and was preparing for an “extensive campaign” on the southern front. Netanyahu also referenced attacks on Iranian targets in Syria, widely attributed to the Israeli military, saying Israel is fighting on multiple fronts. “We are operating on several fronts simultaneously. Not far from here are the Golan Heights, our sovereignty over which was recognized by President Trump three days ago. This is a tremendous diplomatic achievement for the State of Israel. Syria’s SANA media outlet reported Wednesday night that explosions were heard at the Aleppo airport. The attack, reportedly a series of Israeli airstrikes, are said to have targeted Iranian weapons depots. A major escalation also occurred between Israel and the Hamas-ruled Gaza Strip, after terrorists in Gaza fired a rocket deep into Israeli territory Monday morning, striking a home northeast of Tel Aviv. Seven people were injured in the attack, which destroyed the Wolf family’s home in the town of Mishmeret. Further rocket fire on Israel left a second house, this time in the southern town of Sderot, damaged, while Israeli forces retaliated against Hams targets in the Strip.